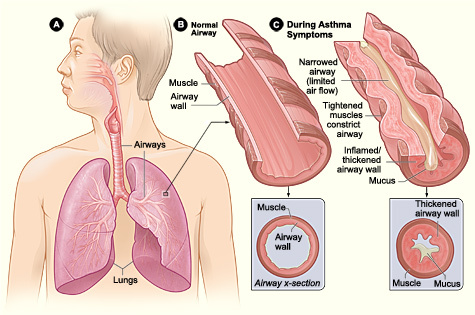 Asthma is common lung disease that inflames and narrows the airways causing uncomfortable symptoms such as wheezing, chest tightness, shortness of breath and coughing, especially at night or early morning. People with asthma have overly sensitive airways that react to certain triggers that do not affect other people. What About Asthma In Fiji? Asthma is a common condition around the world. According WHO, lung disease, including asthma, is the third biggest killer of the NCD’s. Fiji has the second highest mortality rate from Asthma in the world. In Fiji, the rates of asthma are rising, especially in the younger population (14-20), which is a big concern. In the past four years (2010 – 2014) Fiji’s main hospitals have seen over 2285 cases and 6.6% of these cases have resulted in death. This would not be the case if these patients knew how to properly manage their Asthma. Why is it so bad in Fiji? Risk factors or ‘triggers’ that can cause an asthma attack include; tobacco smoke, air pollution, inhaled allergen such as dust mites, pollen, animal fur from cats and dogs, strong emotional expressions, chemical irritants and drugs such as Aspirin and Beta Blockers. Other triggers include weather changes ad cold and flu symptoms. Asthma cannot be cured however it can be successfully controlled with proper treatment. Some children can grow out of asthma. Maintaining good asthma control will enable you to live a normal, healthy life. How Do I Treat My Asthma? 2. Reliever medications: these should be carried with patients and used whenever they have an asthma attack. They are inhaled and provide rapid relief of symptoms. Maintaining good asthma control will enable a person to participate in more school, work, household commitments and other social activities thus preventing frequent visits to the Emergency Departments or health facilities. Your doctor or nurse will figure out which treatment is best for you and show you how to take your medication. It is good to see the same doctor about your Asthma as they are aware of your history and needs. Can I Control My Asthma? People with asthma can control it, however, they must have access to effective medication, have a good knowledge of their condition and how to use their medications and avoid triggers that could make their condition worse. KNOW when you are having an attack, understand the symptoms and learn to seek help early. The severity of an asthma attack varies in individuals. Symptoms can last from hours to days or weeks and months before medical advice is sought. Mild –person can speak normally but may have a slight wheeze or mild cough – especially when excited or running. Moderate – person may speak in half sentences; their breathing will be difficult and you may hear them wheezing; and they may have a persistent cough. The right treatment for asthma attacks comes down to good planning and being prepared. Talk to your doctor about the best way to manage your asthma. See http://www.health.govt.nz/your-health/conditions-and-treatments/diseases-and-illnesses/asthma for more information on asthma attacks. A child who has parents or other close relatives with allergies or asthma, is more likely to develop asthma. You should be able to recognize the signs of asthma in your child and know how to manage it. Did you know that asthma is twice as common in boys than it is in girls. If other members of your family have asthma, you should be extra careful to watch for warning signs in your child. The good news is, many children grow out of asthma by the time they reach adulthood. If you avoid the cause/triggers of asthma, you can usually avoid asthma attacks. The more you know about asthma and management, the more your child can stay fit, healthy and happy. TIP: you should always keep a record of your concerns and your child’s symptoms so you can discuss with your doctor, as this can help in the treatment. Make sure you can be contacted if needed. It is important to know that exercise is good for children with asthma as long as you know how to manage their asthma well. You should speak to your health professional about the best way to manage this. Team sports – especially those with lots of stopping and starting, a break in action is good.